I live in Windsor, which is situated in Berkshire, around 20 miles to the west of London. I settled here four years ago and it’s a delightful place. However, this week my small town has become the centre of the universe (or so it seems), and it’s been almost impossible to walk out of the front door without bumping into a camera crew. The impending Royal Wedding is certainly a much-anticipated event, and I wish the royal couple every success for their future married life. But if your interest in this regal occasion has already waned somewhat, you might like to take a look at this concert, to be held on the same day at 7.00pm in London. 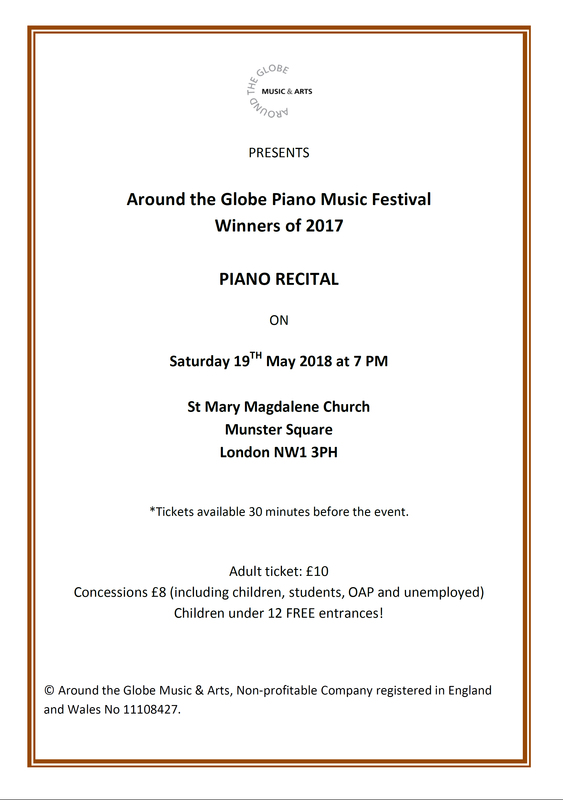 The Around the Globe Piano Festival, organised by Marina Petrov and Maya Jordan, is a wonderful music festival and concert series which fervently supports Contemporary composers. The Festival is held in the Autumn every year and is open to all levels and abilities. I adjudicated at the 2017 festival and thoroughly appreciated the wide variety of repertoire on offer. The standard of performance was also extremely high, and winners are invited to perform at various concerts arranged throughout the year. 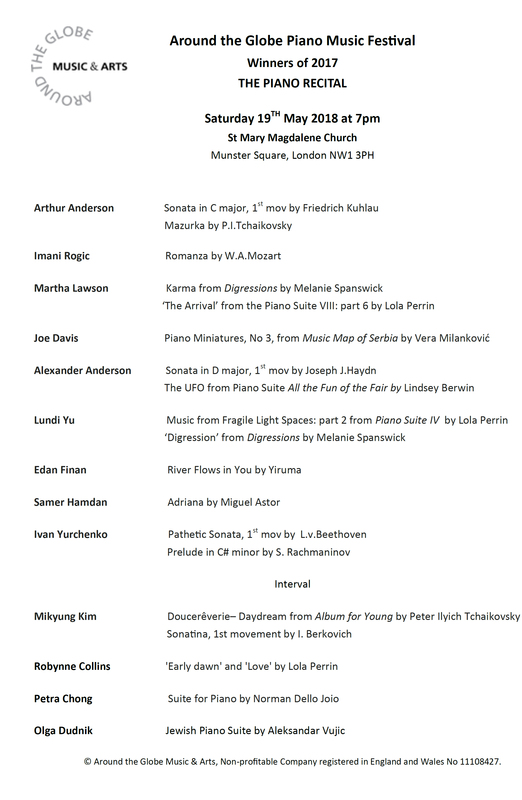 I’m honoured to be amongst the group of Contemporary composers whose music features on the syllabus. The piano recital on Saturday showcases winners from last year’s festival, including children, adult amateurs and professional pianists. A diversity of styles pervades, from classics to modern, including compositions written by a host of innovative composers including Lola Perrin, Lindsey Berwin, Vera Milanković and myself. Guest pianist Olga Dudnik will perform the captivating “Jewish Suite” written by prominent Serbian composer, Aleksandar Vujić. You can book your tickets via the Around the Globe Piano Festival’s website, or alternatively you can purchase them at the door. Hope to see you there!